Do you want your enemies to have levels like actors? You could use levels as a way to determine their difficulty level compared to the actor’s current level. For example, if your actor is currently level 10 and the enemy is level 20, you might use a red font to draw the enemy’s name to indicate that it is dangerous. Levels themselves do not mean much on their, for they are just a number. They become more powerful once you use other plugins that make use of them. 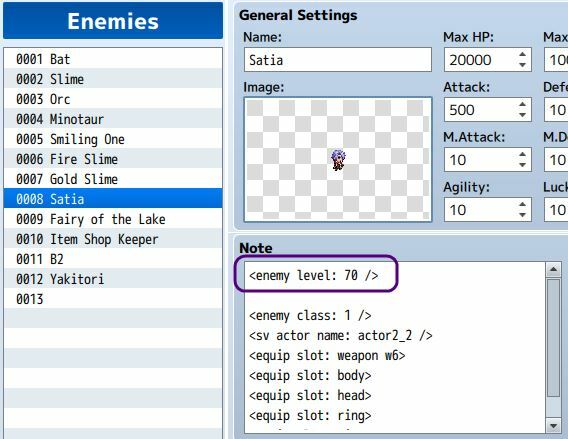 For example, a plugin that you can use is Enemy Classes, which allows you to assign classes to enemies. Using both plugins, you can now set up parameters curves based on the enemy’s level, as well as the skills they can use based on the level. Download ths plugin and place it in the “plugins” folder in your project’s “js” folder. Then open your Plugin Manager (F10), double-click an empty row, and select the HIME_EnemyLevels plugin. Which means the enemy’s level is equal to 5 plus the value of variable 3 multiplied by 4. This can be used to set up dynamic levels based on things like difficulty. If you specify a negative number, it will subtract the level. There is an VXACE version but that’s on under the RGSS3 Scripts page. You’re on the one for MV. General rule of thumb for Himeworks plugins is to check under the plugin library list ie for VXACE go to RGSS3 Scripts or for MV go to MV Plugins. I have got a problem with this plugin. I set my enemy’s level based on my party leader’s level like this: $gameParty.leader().level + 5. Oh sorry it was my bad. I also used your Parameter Tables plugin and i forgot to add data for enemy’s class above level 99 so the issue happened. Hey, i have a question ? Can we put a variance in the formula ? I want that the level can vari randomly more or less than the level i set ! Is it fine if I slightly modify the script to raise the enemy max level from 99 to 200? Tyvm for the solution the name was different, I do not really get how that could have happened but it works again! I am using your level and classes plugin but now the level plugin gives a error ‘format’ undefined. Could you pretty please update this plugin? The plugin works for me. Have you named the plugin file properly? In your plugin parameters, does it show a “Name Format” option? Anything I can do to add varying levels to one Monster? This depends on how the monster is encountered, but you can use a game variable to keep track of how many times the monster was encountered, and use that to change the enemy’s level when the battle begins. Do you mean their current HP is the same, or their max HP? You will need to recover their HP since changing levels doesn’t restore your HP/MP. I want to change enemy lv out of the battle, its possible? Enemies do not exist outside of battle by default. Do you have enemies outside of battle? To add variable 2 to the first enemy’s current level. The parameters and everything seem to all function as expected. But the enemy is not using the skills based on level, but instead relies on ones set on the enemy page. Deleting all moves on the enemy page just makes the enemy do nothing. Am I missing something? Please let me know ASAP! I’m assuming you are referring to enemy class. Currently I have not implemented logic for disabling actions based on class learnings. I will let you know when it is updated. I seem to be having a problem getting this plugin to work, I’ve gone so far as to turn off all other plugins, and I can neither get it to call upon the enemy level for damage formulas or get it to show the enemy level in the name. I used in the notebox, I have the plugin on, above all other plugins, and no other plugin is on. Am I missing a core plugin or something? When you add a new plugin, always save your game. This avoids “battle test” issues if you’re using that to test your battle. Anyway I can use the enemies level in a damage formula through a variable or a script call or something? I’m trying to replicate FF X-2 damage formula which increases damage based on the users level, but I’m not sure how to do this with enemy attacks. Yes. Accessing actor and enemy levels are the same in damage formulas. How can I make the enemy level equal to the players level with a formula? How would you create a skill similar to Level 5 Death/Goblin Punch (both skills using the enemy’s level as a means to determine the skill), or does your script not support using enemy levels in the formula? Goblin Punch won’t work for checking if the target’s level is equal to the users with enemies. What am I doing wrong? Does it work if it’s the actor using it on enemies? and it’s not updating anything when I modify the level of the enemy. It’s also not increasing the def of the enemy when I increase the level. I am using Yanfly’s scripts, and I’ve tried it above and below Yanfly’s Battle Core. lol I’ve had that happen several times as well. I wonder if you can get the level to display on Yanfly’s Battle Core. I have updated the plugin to support displaying enemy levels in the enemy’s name. There is a new plugin parameter, so you will need to double-click on the plugin to get it to show. See usage section for more info. If it does’t exist already, I will provide some plugins to set EXP based on some formula of your choice (eg: to include level). Or perhaps use a spreadsheet to manage EXP for each level… Not sure which one you would prefer. I will explore some solutions for EXP tables. I was wondering if EXP in relation to enemy levels was still in the works? For example, a level 8 enemy would give no EXP to party members above level 8. I feel like I read somewhere that you had written something similar to this but had not released it yet. Thanks so much for your excellent work, Hime!